Calling Georgia Nurses of all stripes, supporters of Georgia CAPRN, GNA, and other organizations come to the Georgia State Capitol on Wednesdays and Thursdays throughout the Jan through April 40 day legislative session to support "Trimming" Away Barriers to Nursing Practice and other bills that benefit patients and nurses. 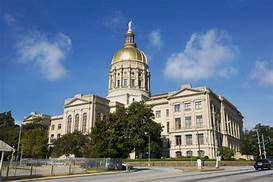 Whether you are a newbie or a seasoned nursing advocate, you will have a great day connecting with Legislators. Students are encouraged to participate in this engaging event! Together with your help we can transform Georgia Nurses into a powerful positve force capable of shaping state health policy. Consider this "basic training" for advocacy work at the Capitol. We need need more nurses with this skill set developed as we continue to build a grassroots movement to remove barriers each year. This year GA CAPRN is again focused on leading efforts to remove the barrier on APRNs ordering radiology tests and on supporting the expansion of PTIP to included APRN preceptors. GNA is leading efforts on creating a Study committee to exam safe staffing practices that takes patient acuity into account and on the funding of the current Nurse Peer Assistance Program to ensure nurses struggling with addiction get the help they need. When: Wednesdays and Thursdays 9:30 am Arrival for briefing/orientation (Legislative session starts at 10 am) through around noon. Plan on possibly attending Key Committee meetings in afternoons on select days. Clerk of House Office room 309 on 3rd floor of Capitol. What to Wear: Lab coat with professional clothes or lab coat with scrubs. CAPRN will provide blue Scarf to signify you are a nurse. Please help me to be prepared. Where do i start?